Hemispherical, Magnalite metal water kettle with wooden handle; integral short squared spout molded into one side of neck; rounded top of kettle is a separate piece attached to the body, giving the appearance of a removable lid. Handle is an arched, flat piece of wood with rounded edges attached with screws to the "lid" above the spout and to the neck opposite the spout. 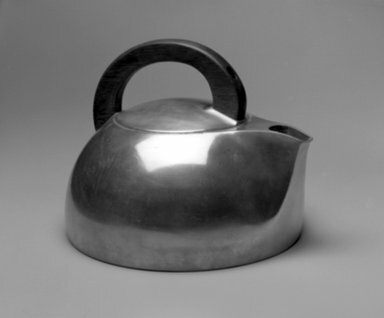 CONDITION: Fair; scratches, abrasions, and small dings all over metal; evidence of corrosion around spout opening, where "lid" and body are joined, on screws, and inside kettle; small scratches on wooden handle.